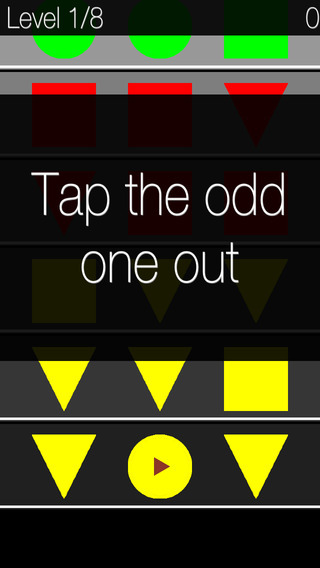 Description from the App Store: 'Oddity is a simple arcade style puzzle game which is inspired by a neuropsychological test of "set-shifting". It tests the intact cognitive functions of the player including attention, working memory, and visual processing. This game should be a good test to for researchers studying Alzheimer's patients. It would make for a good baseline test to see if participants could match their baseline score. And it could measure how far it's fallen. As a reflex game, you won't want to play Oddity more than a few times. The rows fall down in a jumpy manner. It would be much better if they scrolled down continuously.